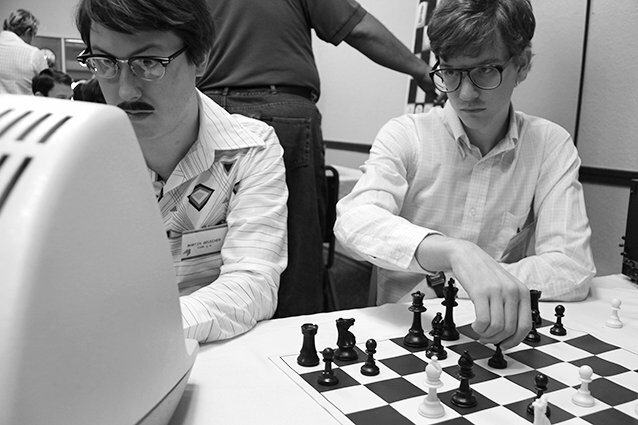 We’ve just gotten through churning out our biggest burning questions about this past weekend’s blockbuster release Man of Steel, so maybe we’re in a particularly inquisitive mindset… but we just can’t bridle the curiosities when it comes to the new trailer for the upcoming film Computer Chess, which looks like the strangest movie we might ever encounter. “Is this a documentary or not?” is one (it’s not). “Is it just a movie about people playing computer chess?” is another (it’s not). “Wait… what… what’s going on here?” is inevitable (we don’t really know how to answer that one, either). This bizarre story, which has garnered acclaim at Sundance and SXSW, seems to encompass a community of computer whizzes, chess masters, conspiracy theorists, and otherwise socially defunct oddballs. And it looks like an inspiring, imaginative project to behold.